Little is known about Jean-Frédéric (or Johann Friedrich) Edelmann, who was from the bi-cultural and bi-lingual city of Strasbourg. After his studies at the university of his hometown he went to Paris where he soon became a celebrated performer at the keyboard and a sought-after teacher. Among his pupils was Etienne-Nicolas Méhul. Later he became heavily involved in politics. He returned to Strasbourg in 1789 and was appointed administrator of the Lower Rhine. He and his lifelong friend Philippe-Frédéric Dietrich, who had become mayor of Strasbourg, ended up in opposing factions during the Reign of Terror. First Dietrich was guillotined, later Edelmann met with the same fate. His role in the Terror is not quite clear. On the basis of the description of the German lexicographer Gerber, Edelmann is considered the bad boy in the story, acting as a witness against his friend Dietrich. In her biographical sketch of Edelmann Sylvie Pécot-Douatte casts doubt on that interpretation. Whatever the truth may be, this episode largely overshadows Edelmann's musical activities. When these discs appeared separately at the end of the 1990s on the French label Calliope they were probably the first recordings of any of his music. They seem in large aprt to have been ignored: a Hungaroton disc with four quartets which was released in 2002 claimed to be the first devoted to Edelmann's music. With this in mind the present reissue is most welcome. Unfortunately much has gone seriously wrong during the production process. First of all, the third disc is marred by strange noises which were absent from the original disc. I know nothing about sound technique, but it seems a kind of over-modulation. It is most clearly audible if one listens through headphones. As this is the way many people listen to music these days this fault needs to be cured. Just as serious are problems with the first disc. If you have looked at the track-list you will have wondered why on earth the Sonata op. 2,2 has been split. It certainly wasn't on the original disc. During the production the first movement of this sonata has been allocated to track 18. So if you want to hear the sonata as it was written and recorded you have to programme your CD player like this: 18-07-08. Such errors are just unacceptable. That is not all. The last sonata of the second disc (op. 6,2) was originally part of the third disc. This explains why in this sonata we hear a different instrument, the same one that is used on the third disc. This brings me to another demerit: the information in the booklet - or, rather, the lack of it. The titles of the various discs refer to "sonatas for harpsichord" and "sonatas for piano". That in itself is nonsense: all the sonatas are written for keyboard, and more specifically the harpsichord. The instruments used here are not specified. On the first disc we hear a harpsichord by Von Nagel, after Blanchet (1730). The second disc - with the exception of op. 6,2 - is played at a fortepiano by Ducornet & Way, after Stein (no date given). The sonatas on the last disc and the Sonata op. 6,2 are played on an Erard piano of 1834. Also omitted are the dates of the recordings and the keys of the sonatas. I have added this information in the header, according to the data in the booklets of the original discs. The track-list of the first disc mentions twice "Sonata No. 2 Op. 2". The second is in fact the Sonata op. 1,3. The booklet only includes the biography of the composer which was also in the booklet of the original release of the first disc. The booklets of the second and third discs went into more detail about the music; that is omitted in this reissue. These defects are all the more disappointing because Edelmann's music deserves better. The sonatas were all printed in the 1770s and early 1780s and intended for the amateur market. Such works were mostly of a galant nature, but Edelmann's sonatas have more to offer. A number of them are in minor keys which is quite unusual in galant repertoire. The same goes for the fact that many sonatas are in three or four movements rather than in two as was common in galant music. Various movements are quite dramatic, for instance the allegro con molto from the Sonata op. 5,2 (CD 2) and the allegro spirituoso from the Sonata op. 5,3 (CD 2). Another example is the allegro vivace from the Sonata op. 3,1 which is interrupted by slow passages. The largo from the Sonata op. 2,2 is an example of a movement of great expressive moment. Various others can be found on all three discs. In her liner-notes Ms Pécot-Douatte writes that the sonatas were mostly dedicated to Edelmann's female pupils, "thus clearly indicating that they were intended for the harpsichord rather than the pianoforte, probably because the ladies of the nobility did not yet possess that new instrument and he did not wish to offend them". If that’s the case it is rather odd that she has chosen a fortepiano for the sonatas on the second and third discs. The choice of a Stein may be justified by the fact that this German fortepiano maker presented his instruments in Paris in 1773, the use of an Erard of 1834 is inexplicable. It is hardly more "authentic" than the use of a modern concert grand. As a result we see these sonatas through the glasses of the early 19th century. It distorts our impression of them, also because Ms Pécot (rightly) uses the full dynamic range of the Erard. She comes up with an argument in the booklet. "Some of the sonatas are so full of imagination, however, with an alternation between vigorous forte and sensitive piano, that one might imagine that they were written with the new potentials of the pianoforte in mind". Are there any dynamic signs in the score or is it just a matter of her interpretation of these sonatas? Anyway, it is quite possible to make dynamic contrasts between passages by switching between the two manuals of the harpsichord. Moreover, these sonatas are all scored for keyboard with a violin ad libitum. This wasn't only a way to add some colour; the violin could also realise the dynamic shadings the harpsichord could not produce. That said, the playing of Sylvie Pécot-Douatte is admirable. The expressive and dramatic features of the various sonatas or movements come across quite well. In the more galant pieces she plays in an engaging and relaxed manner. It is just a shame that some of her interpretations tend to misrepresent the character of Edelmann's sonatas and make them more 'progressive' than they are. 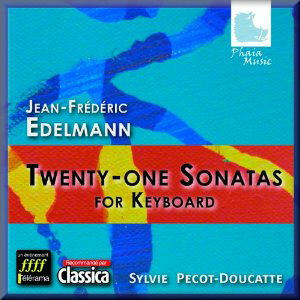 Anyone with a more than average interest in the keyboard music of this period should investigate Edelmann's sonatas. Given the shortcomings signalled above it is advisable to look for the original discs which are still available. The label is Calliope, and the catalogue numbers are 9237, 9236 and 9296 respectively.